You may have noticed that there are options to add an electric powered tongue jack to your camper. Or maybe you had one go out on you and trying to decide if you should replace it with another electric or replace it by installing a manual trailer jack. The short answer is, it depends on what you want and how much it is worth to you. 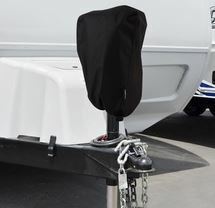 Today, we will be going over the pros and cons of electric camper tongue jacks, and give the information you need to know to make that decision. Our 2013 camper came with one included and I felt all fancy having it, even my brother in-law was envious as he was cranking his. He had the last laugh once mine failed in year three of having the camper. I ended up replacing it with a manual jack before a tree fell on our camper the following year. The one most important thing to keep in mind when deciding to add an electric tongue jack to your camper is realizing that your adding another failure point. At some point in the future, you will need to replace it again. When you have a manual jack, there is not much to go wrong with it. Maybe a little grease in the gears and you should be good for as long as you own your camper. When you have an electric trailer jack, it will fail at some point. Though there are brands out their considered to be the best trailer jacks, the better you take care of it, the longer it will last. I learned a lot about this when we got our new camper and here are some tips to keeping your camper’s electric front jack in good shape. By following these tips, you should get more years out of it. You can buy small covers specifically for your these. Don’t just use the cover when your camper is stored, but always have it on. We remove it during travel and set up and put it back on. So why is it important to keep them covered you ask? Two main reasons. First the cover will keep rain from penetrating your motor. This is what happened to our. It filled with sitting water which rusted everything inside. Eventually, the motor would not run. Next keeping it covered will help with the sun rays which will make the casing brittle. Everything sun destroys everything camper. It will start to fade, then start to get brittle and eventually crack/brake. Luckily we didn’t have this issue because our camper was so young but I learned this when researching once we got our new camper. It just makes sense. The next tip is to make sure you use dielectric grease on all plugs that are not covered by heat-shrink. Moister and electric doesn’t go well together. Have you have seen corrosion on your car batteries? Taking off the case and adding some dielectric grease to all the plugs will save you frustration down the road. When looking into if we should replace our electronic camper trailer jack, the first thing that came to mind was price. Knowing that everything camper related seems to be over-prices, I was expecting a $500 price tag. I ended up surprised when I actually looked them up and was seeing many for under $200. Price will depend on size which we will talk about below but you can expect to pay between $150-$300. What Size Electric Tongue Jack do I Need For My Camper? If you replacing or adding an electric jack to your camper, picking the right size is probably the most important decision you will make. If you select an under-powered jack, you will replacing it sooner rather than later. This takes a little more math than one would think but, it’s not too hard to figure out. Remember when looking for a jack that it will not be lifting the whole camper. So camper weight in itself doesn’t come into play here. The jack needs to be rated for your campers tongue weight plus your load. Let me explain. When you look at the sticker on your camper with VIN, weights, etc, you will see the tongue weight. This is the weight the camper puts on the tongue. The rest of the weight is on the tires. Keep in mind that the weight on your sticker is for a stock unloaded camper. It doesn’t take into account of anything you place in it. And “things” are heavy! You can always go up a little if you are unsure. Better to have too much power than not enough. Lastly, if you are replacing a manual camper jack with an electric, you will need to run a few wires for power. This is not an issue for some but others may need help. You can expect camper service shops to be expensive and I can see the price of your new electric camper jack to double if having a shop install it. It really comes down to personal preference and how much an electric camper jack is worth to you while camping. It may be a great choice for someone older that may have issues hand cranking the jack but not worth it to the dad who may have to crank the leveling jacks anyway.